Interior walls are often used in addition to the load-bearing walls in modern homes. They can perform different functions depending on the space design. Partitions of different materials can serve as elements of zoning, to be a support for a variety of storage systems, appear as arrangement of the video area, or simply serve as a decorative element. For example you can see the different types of interior partitions in the actual design projects presented in our photo collection. You can learn in detail what materials are used to manufacture interior partitions and what are the latest trends in design applied to modern interiors of urban and suburban dwellings. 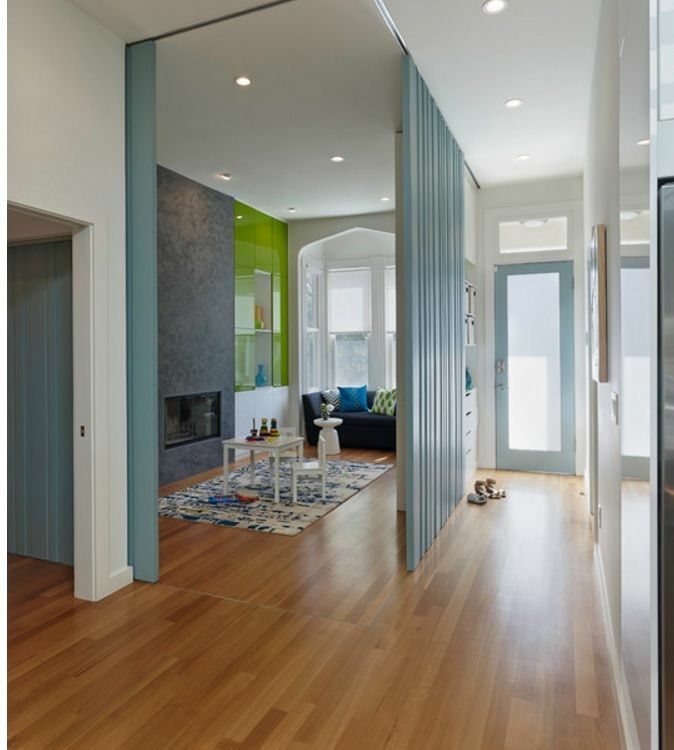 We hope that the interesting interior partitions room zoning design ideas, practical and functional variants of interior partitions will inspire you for the small renovation or reconstruction of your own house or apartment. Speaking simply, interior wall is the mere wall but in a lightweight version. The main function of partitions is the division of space, therefore – area zoning. But there are also decorative partitions, which carry a very conventional separation and is more likely for decoration of the interior. There are blank, transparent and combined design types of partitions for space zoning. Let us review the most popular options of interior partitions and their scope. Constructions of brick, stone, plasterboard, aerated concrete, wood and glass blocks can be related to stationary partitions. These are partition carrying not only the zoning function but also appears soundproof for space segments. They have good moisture resistant properties. They are strong and durable. You can hang shelves, television and allocate different wall décor on these partitions. The so-called partition-screens look like support to which the base material of the screen type is attached. Depending on the complexity of the design and the selected material supports and screens, like partitions can be set both by professionals and by yourself. Constructions are strong enough, but not to fasten shelves or drawers them. The advantage is that even despite obvious zoning of the space, the light is partly falling from one zone to another. Pay special attention to the proper lighting of the dividing wall as it can significantly increase the interest to the decorative elements on the shelves. Partitions-racks are incredibly popular because of their functionality. Open or combined shelves can be placed both on the floor and at some distance from it – depending on the location of furniture in the functional area. You can perform two-way rack or blank on one side. It is apparent that such structure should be sufficiently strong and durable. One of the options to make a fixed baffle in the area is the construction for a fireplace. Duct of the hearth should be located in the cavity of partition. So that it should have sufficient internal space. The advantage of such a fireplace type, which is located inside the wide walls, is the ability to watch the fire from different points of the room. But there are also disadvantages of such structures. If you do not need the permission of appropriate services for the construction of the glass or wooden interior walls, the installation of the fireplace will not be so simple, especially in apartment buildings. Some interior partitions are a real complex consisting of storage, work surfaces and integrated household appliances into the space of the structure. For example, here is a furniture ensemble located between the kitchen and dining areas. Stationary interior partitions have a mass of variants of application within both small apartments and large private houses. For example, the use of partitions to separate the space of the bedroom and bathroom is fairly frequently used design method. This partition allows you to locate sink with mirrors (hidden in the oral communication more walls) from the bathroom side, and to hang a picture or a TV-set, open shelves for books or small things from the bedroom side. A similar version of the combined partitions allows you to create a whole range of storage systems, placing the video area on the one hand and a desk on the other. Such a construction would be appropriate in the living room with the home office located there. Using stationary partitions in the large living space helps to separate the dining area or library. As a result, you can achieve the desired privacy of certain functional segments of the home. The same goes for separating the dining room from the living room. 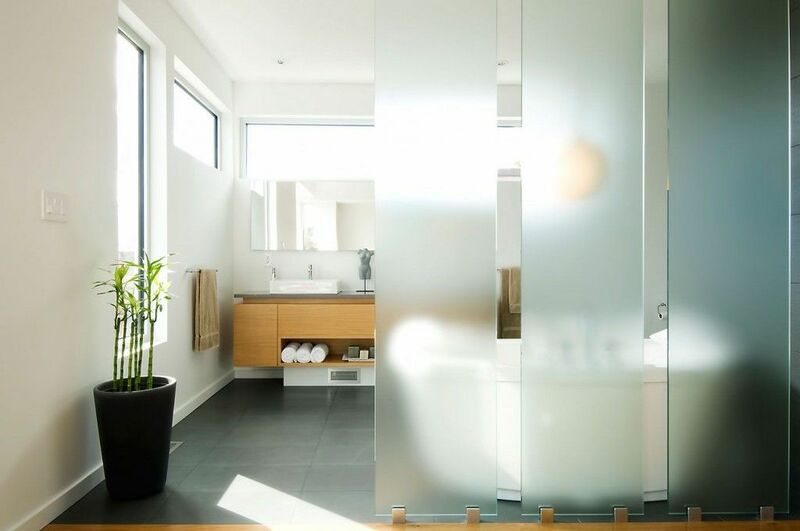 Glass partitions do not hinder the penetration of light, but they create an intimate atmosphere. Decorative “lacy” partitions are separating the living room from the dining room without preventing the penetration of natural light. They add a unique interior, but at the same time perform their main function of zoning the space. A similar partition can be used as a zoning element for spacious utilitarian premises. In this case, you must be sure that the material has a relatively high water-resistant qualities. The one-room studio apartment is very difficult to do without partitions. The partition of light wood will be perfect for allocation of sleeping segment, because of that material is actively involved in the manufacturing of the furniture and even decoration. Some types of fixed partitions are created not only for the purpose of zoning, but rather as holders. Most often, these constructions are used to fix the TV and other video-audio equipment. From the name itself it is clear that these interior walls serve as walls and doors simultaneously. Whether the partition is moving apart as sliding doors or folded like a book but the main function of zoning areas is in the first place fur suchlike construction. With glass folding partitions in the form of sliding doors you can effectively isolate the functional segment placed in a room with other practical purpose. For example, to fence off the bedroom located in the living room. The same can be done with the cabinet located in the studio or dressing room located in the bedroom. Such walls have sufficiently high insulation properties They are strong and durable. But to mount such constructions by your own would be very difficult. 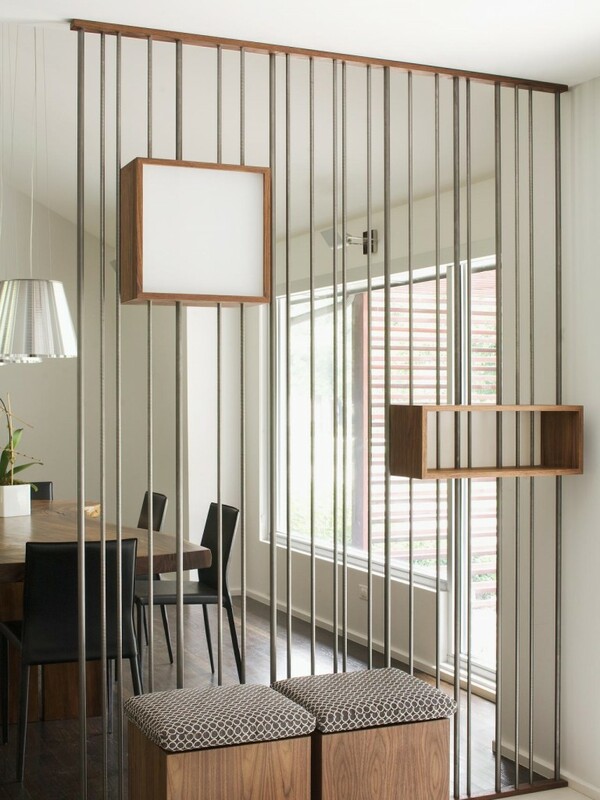 Sliding partitions on the type of wooden horizontal blinds fit perfectly into modern interiors. 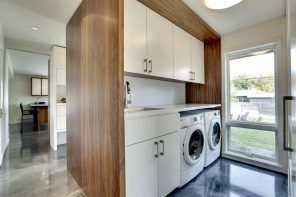 Especially if the wood color is repeated in the other elements of the interior design. Swivel design from MDF can perform several functions. Both to serve as a holder for video equipment and to be used as a storage system in the living room area. Also you can hang a mirror or a picture in the bedroom segment on this partition, not to mention the fact that it can be rotated depending on the situation. Rotary partition-blinds of vertical modifications allow you to create different levels of closed functional areas within the large room depending on the angle of rotation of the structure. Typically, these partitions are equipped with electric drive and equipped with a remote control. Combined – Metal-plastic or metal frame with inserts of glass, bamboo, textiles, reed paper. 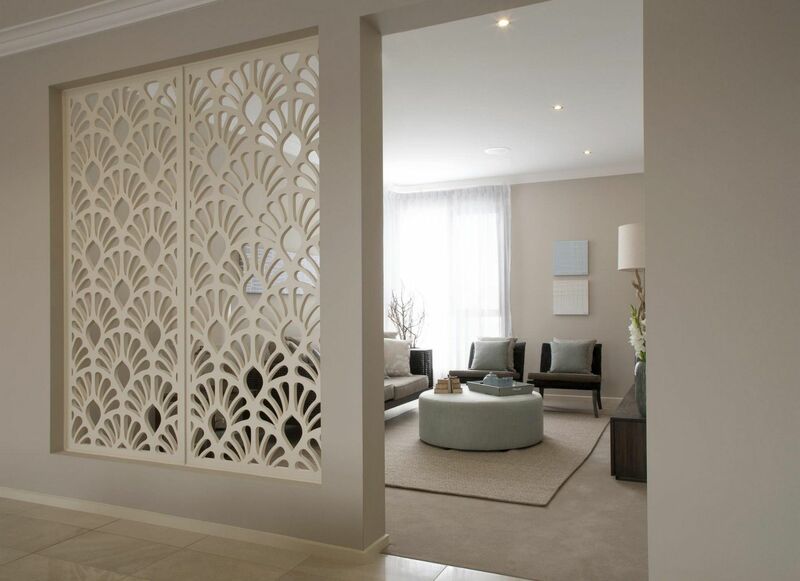 Most often you can find the use of drywall to create a perfectly flat and smooth surface of interior partitions. These designs are easy to install. They can be installed by yourself and take up little space. The only drawback of drywall partitions – it has no sufficient solidity for mounting shelves, cabinets and other fixtures. 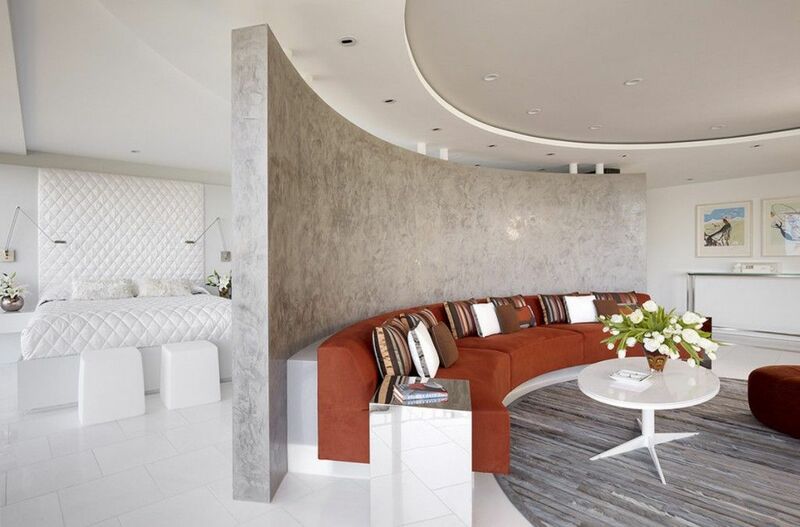 Plasterboard partitions can even be curved if you like. Finish of obtained smooth surfaces can be implemented according the basis of stylistic, color and texture solutions of the room. Wooden walls bring the natural warmth and uniqueness to the interior. Wooden constructions are not only relevant, but also become the highlights of design for many interior styles. 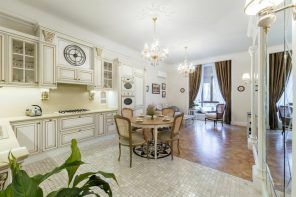 For example, of this particular studio kitchen in the large apartment in Europe. Wooden partitions can keep their natural color or may be covered with paint. One of the most popular paint colors is white. Lace designs of white are airy, but only for the first sight. 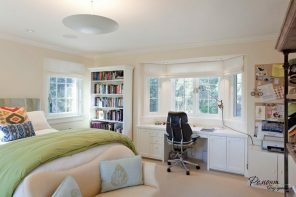 In fact, these walls can easily support the weight of open shelves or even shelving, perform the functions of the desk stand or dressing table (depending on the functional purpose of the room). 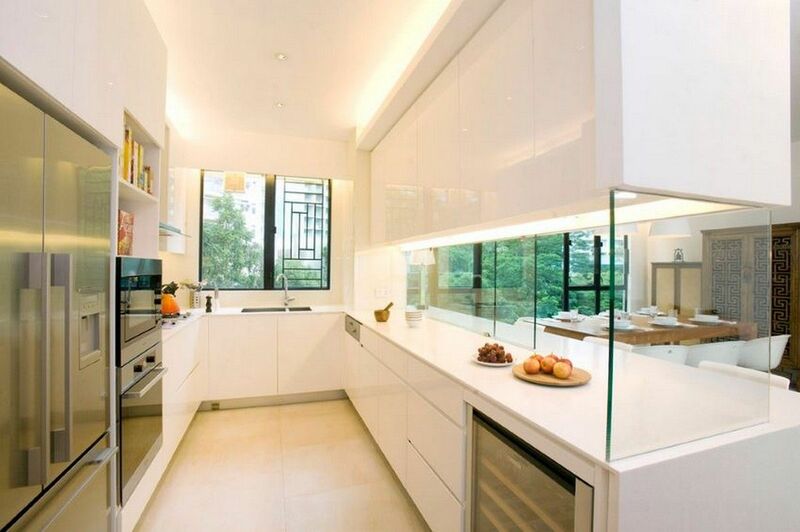 Acrylic surfaces (variation of decorative glass) are also common in the design projects recently. Eco-friendly, durable, wear-resistant but lightweight at the same time constructions of acryl can be a practical decoration of modern homes. Surfaces are available in transparent and tinted versions. There are models with stained glass either. Specially tempered glass with high strength and durability properties is used to create the glass partitions. Of course, such structures are not cheap and for their installation it will be necessary to refer to specialists. Corrugated frosted glass is permeable by light, but it is almost completely hide what is happening behind the partition. 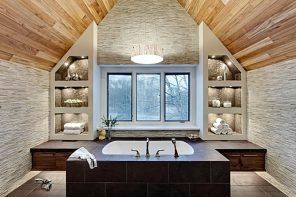 This design would become practical and functional design solution in order to separate bathroom area located in the bedroom. Similar versions of glass partitions but in a sliding form can be used to separate the kitchen from the dining room or living room. Polycarbonate partitions are lightweight, durable and easy to clean. You do not need to worry about the possibility of breaking the partition (especially true for homes with small children) with such material. Theoretically, these partitions can be set by yourself. Nevertheless, they must be very precisely measured to provide unobstructed partition movement along the rail-holders. In such case the construction will last long. Combined partitions can be met nor less frequently. The base of such constructions can be made of the drywall (which can take almost any form, even wavy) with inserts made of other materials (wood, polycarbonate, glass or even facilitated weaving rope, twine). Partitions on a steel frame with wooden elements arranged in a chaotic manner are not much zoning but rather a decorative design, which brings uniqueness, originality and creativity into the interior. 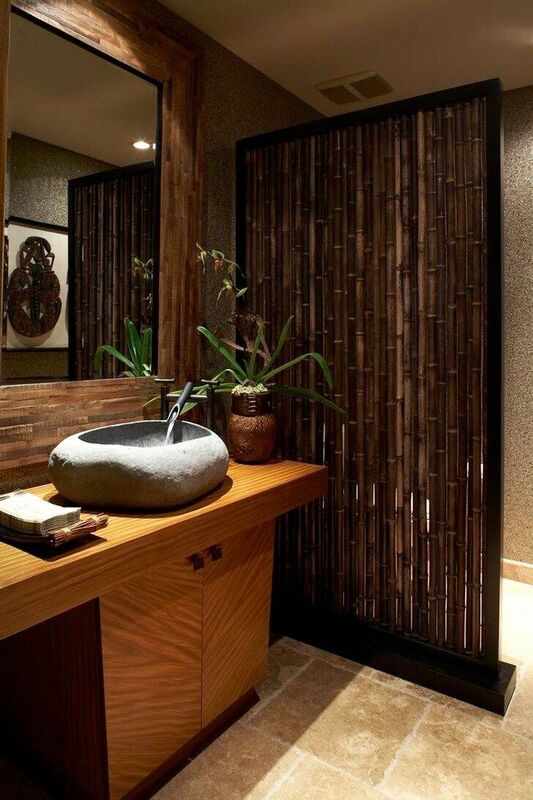 Optionally, using of bamboo covered with special varnishes and antiseptics for long-term operation for the manufacturing the partitions in a utilitarian room with high humidity, can be considered as original design solution. For example, you can separate the toilet zone from the water treatment segment in the bathroom with such decorative wall. Another way of bringing originality to the interior is the use of a suspension composition complied of steel chains. 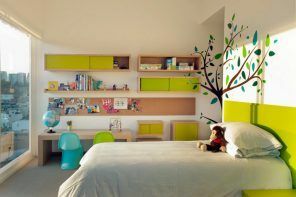 These stuff will have organic look in the room, which is decorated in a modern, loft or high-tech styles. 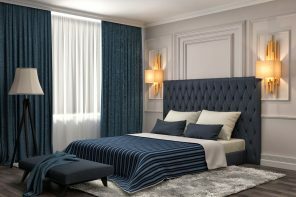 In terms of ease of installation, the most practical zoning options of functional segments in the room are simple curtains. Thick curtains on lurex inserted into the metal rod will become an organic complement for the modern interior. Design of the room in a nautical style involves the use of decoration and finishing materials that are associated with the sea, beach, ships….